The fully automatic and affordable Versa Lift attic solution is the answer to all your storage needs. Home organization doesn’t have to be a chore when you have the option of convenient attic lift system. Whether you are facing a garage jammed packed with twenty years of clutter or you have just a few large items to store, the easy answer is the safe answer. 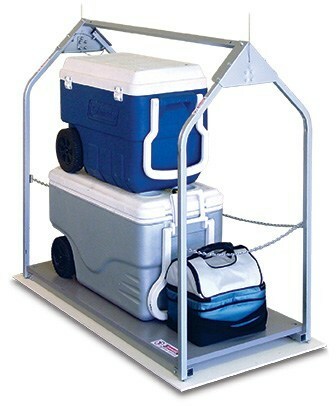 The VersaLift revolutionizes how home storage is done. An attic lift system will make your life easier as you put valuables into the garage overhead storage. The VersaLift works on simple push button technology that allows you to conveniently and easily move unused or rarely used items to a ceiling storage unit. This automatic attic lift system allows you to safely elevate items and secure them conveniently overhead where they can be easily retrieved when needed. By attic lifting items such as luggage, bikes, and even lawn furniture up and out of the way your garage becomes organized and clean. In many cases a wireless unit may be your best bet. The wireless will allow you to operate the unit while you stand by and hold down the button. We have designed the unit so you can hold the operating button down while the unit raises or lowers. This is a built in safety function that is important while you are using the system. Join our family of satisfied customers and find out why they say that Versalift storage solution.